6. 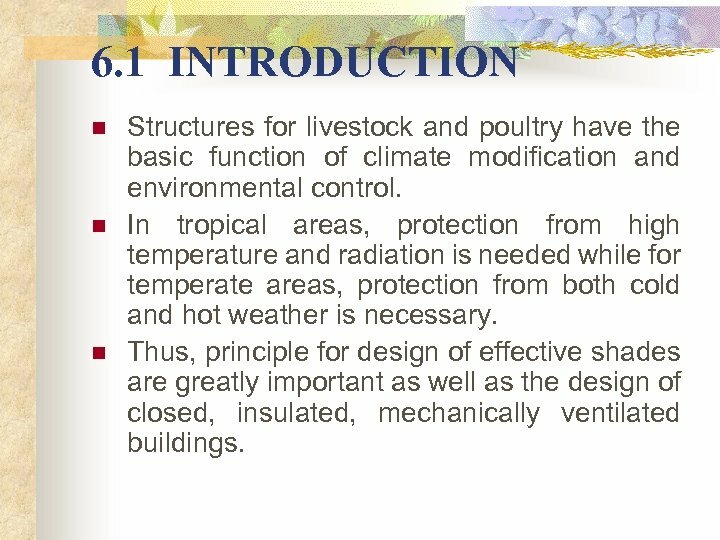 1 INTRODUCTION n n n Structures for livestock and poultry have the basic function of climate modification and environmental control. In tropical areas, protection from high temperature and radiation is needed while for temperate areas, protection from both cold and hot weather is necessary. Thus, principle for design of effective shades are greatly important as well as the design of closed, insulated, mechanically ventilated buildings. 6. 1. 1 Environment n n An animal's environment is the total of all external conditions that affect its development, response and growth. Factors can be: a) Physical eg. space, light, sound, pressure and equipment. 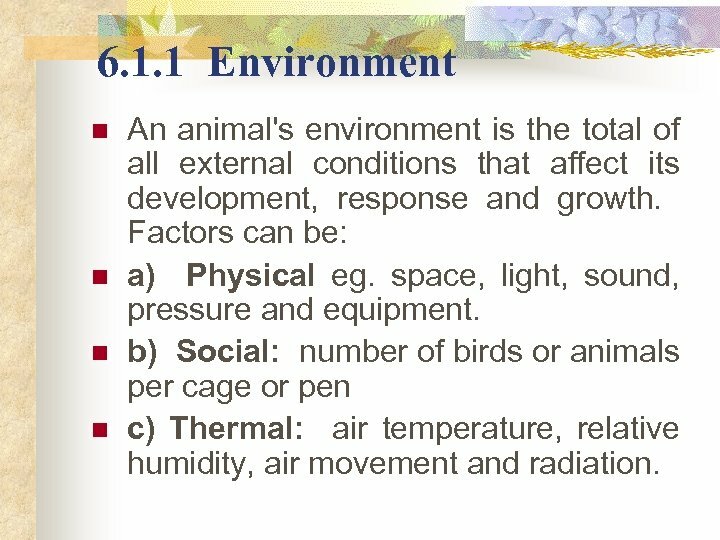 b) Social: number of birds or animals per cage or pen c) Thermal: air temperature, relative humidity, air movement and radiation. Homeothermy Contd. n n Animals struggle to maintain this constant temperature and prefer to be in a restricted temperature range called the comfort zone. At this comfort zone, the animal can physically adjust to maintain this temperature. For man, the comfort zone is between 22 ° C to 30 °C. 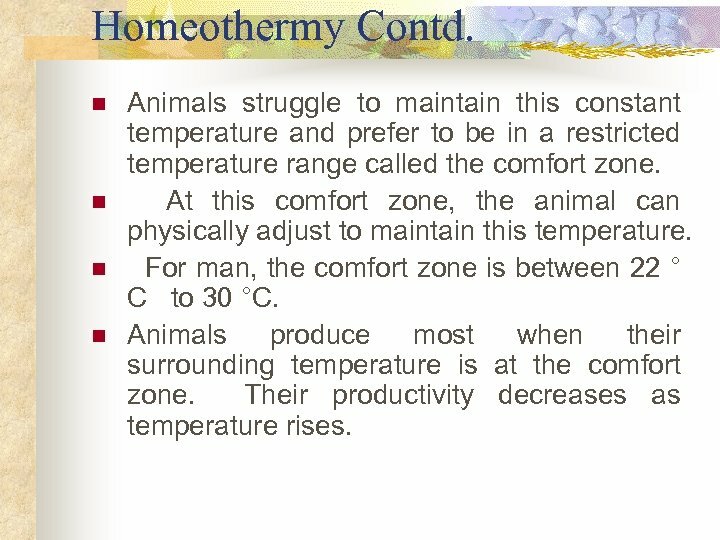 Animals produce most when their surrounding temperature is at the comfort zone. Their productivity decreases as temperature rises. 6. 1. 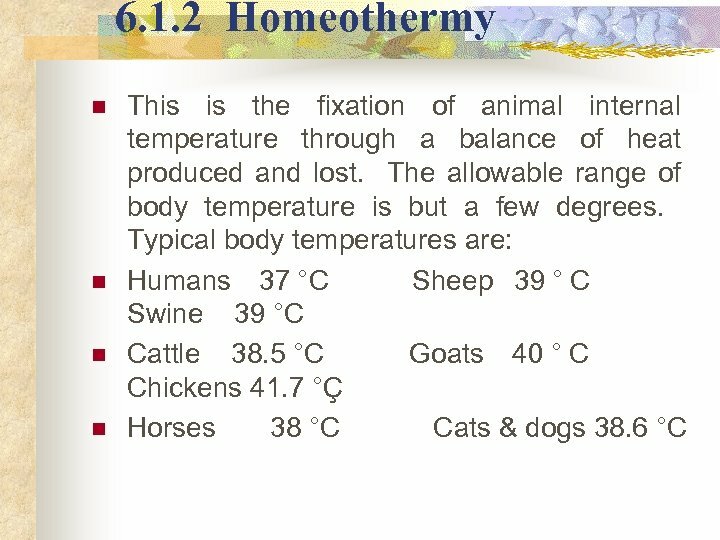 3 Balance of Heat n n The maintenance of essentially a constant body temperature by the animal while subjected to a wide range of environmental conditions depends on balancing heat production and loss. 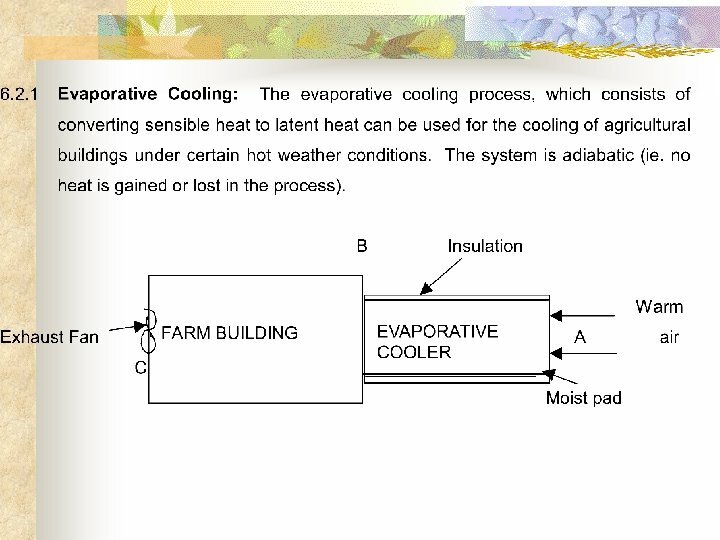 Heat can be transferred by conduction, convection, radiation and evaporation. 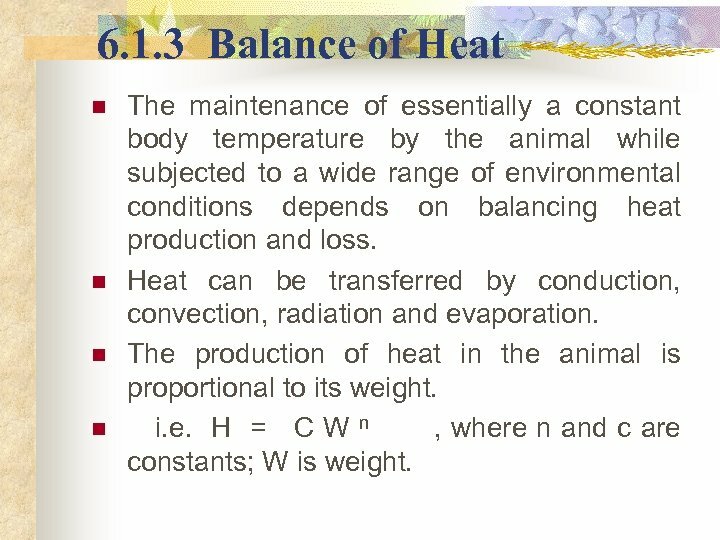 The production of heat in the animal is proportional to its weight. i. e. H = C W n , where n and c are constants; W is weight. Balance of Heat Contd. 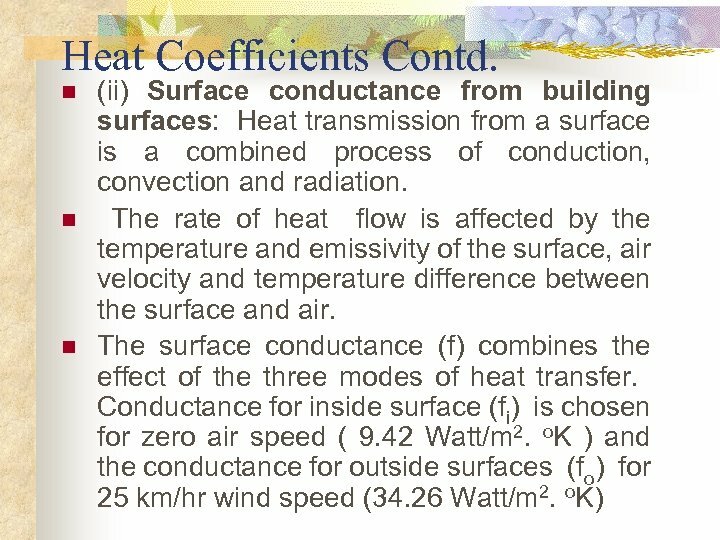 n n n For conduction, heat loss depends mainly on the surface area exposed to the environment. For cattle, total surface area can be empirically related as: A = 0. 12 W 0. 60 ; A is area in m 2 ; W is body weight in kg. A big animal has a large total surface area but a small surface area per unit weight while a small animal has a big surface area per unit weight. 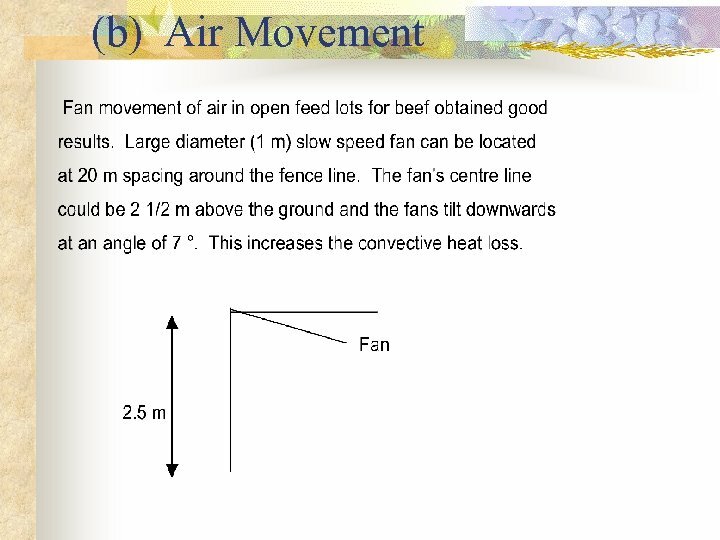 This latter factor controls heat loss from the body of an animal. 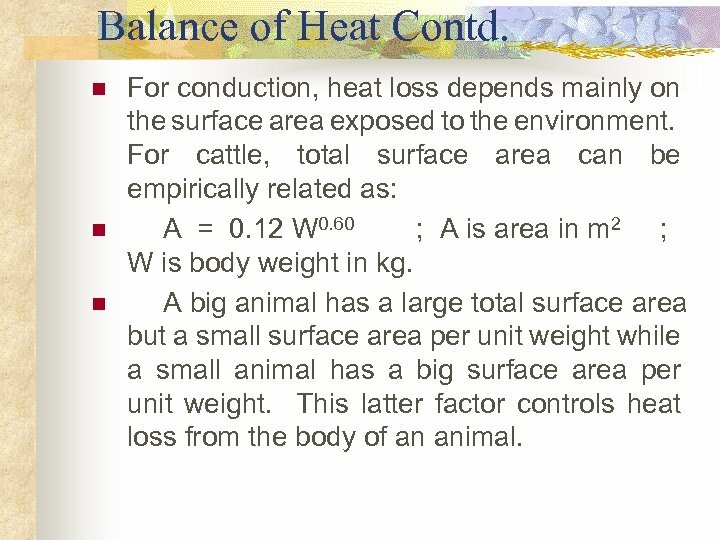 Balance of Heat Concluded n n n This follows that: A big animal produces a large amount of heat but loses a small amount of it, while a small animal produces a small amount of heat but loses a large amount. Also, unlike in a big animal, a small one has its insulating and temperature controlling mechanisms still under development. This means that: Small animals cannot live in cold environment while larger ones can. 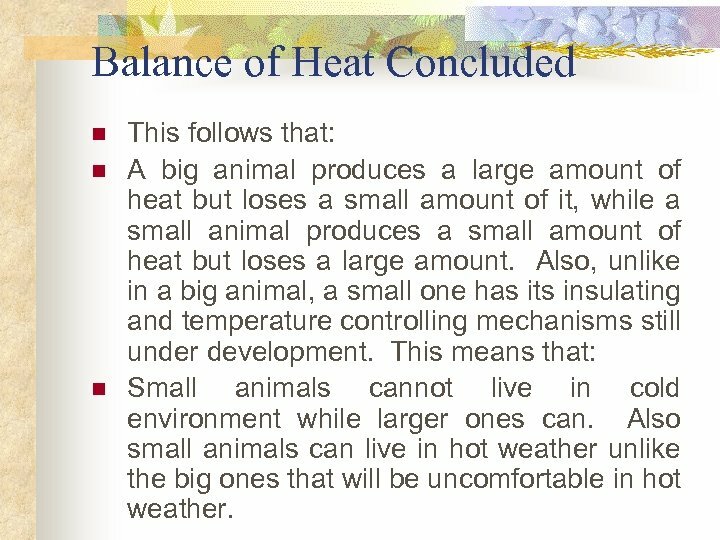 Also small animals can live in hot weather unlike the big ones that will be uncomfortable in hot weather. Definitions Contd. 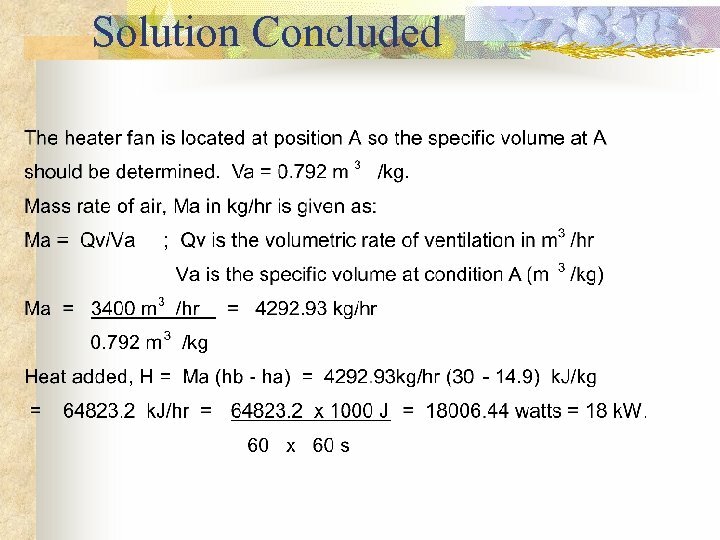 n n n c) Specific volume(V): of an air/water vapour mixture is the space occupied by the mixture per unit mass of dry air. It is expressed in cubic metres per kg (m 3 /kg). 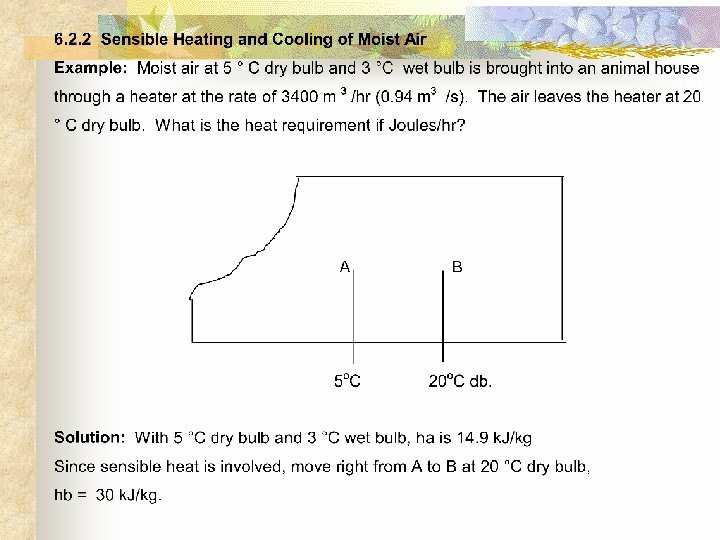 d) Dew-point temperature: The temperature at which the air is cooled in the atmosphere without change in the humidity ratio during which the moisture condenses. 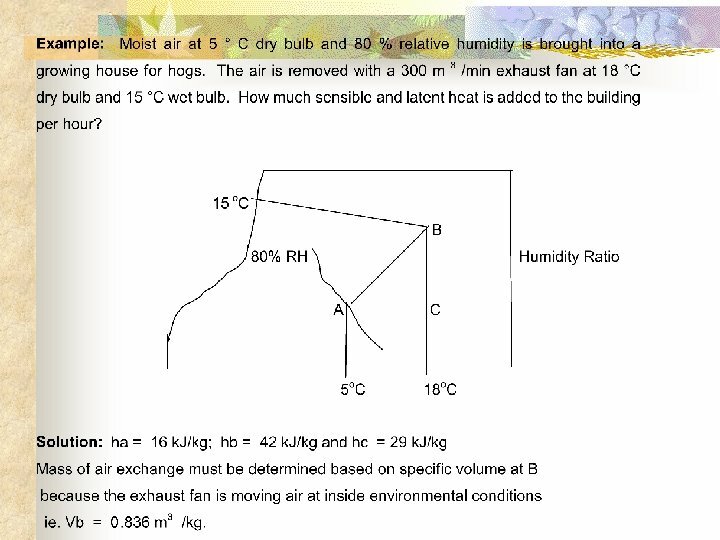 e) Enthalpy: The total heat in an air/water vapour mixture. This includes both sensible and latent heat. 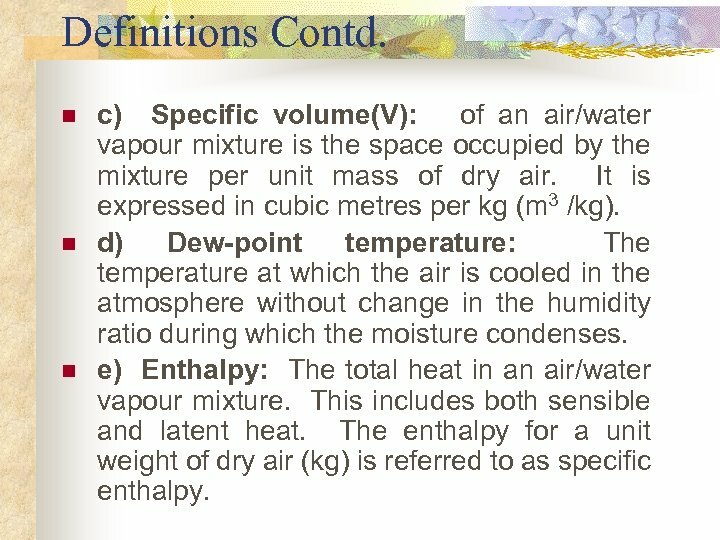 The enthalpy for a unit weight of dry air (kg) is referred to as specific enthalpy. Pychrometry Contd. 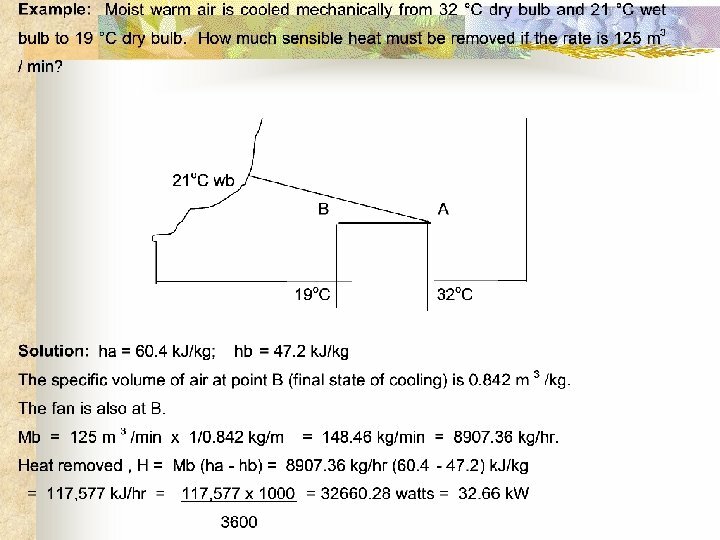 n n h) Wet bulb temperature: The temperature obtained by vaporizing moisture to bring it to saturation at constant enthalpy. 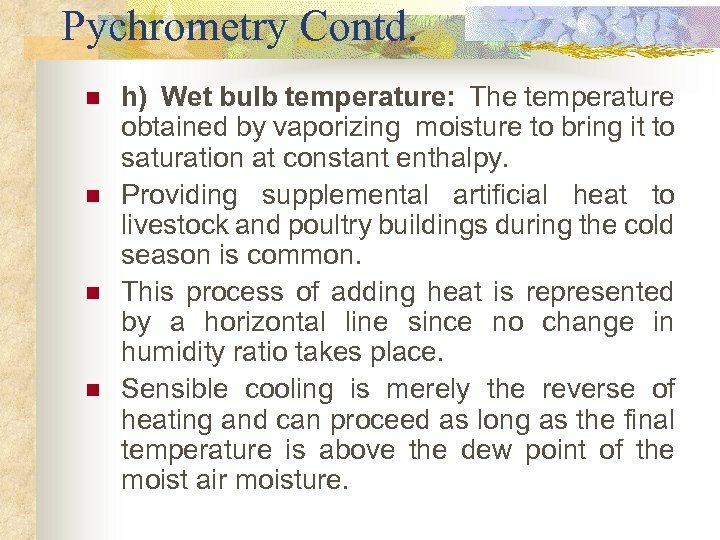 Providing supplemental artificial heat to livestock and poultry buildings during the cold season is common. This process of adding heat is represented by a horizontal line since no change in humidity ratio takes place. Sensible cooling is merely the reverse of heating and can proceed as long as the final temperature is above the dew point of the moist air moisture. 6. 2. 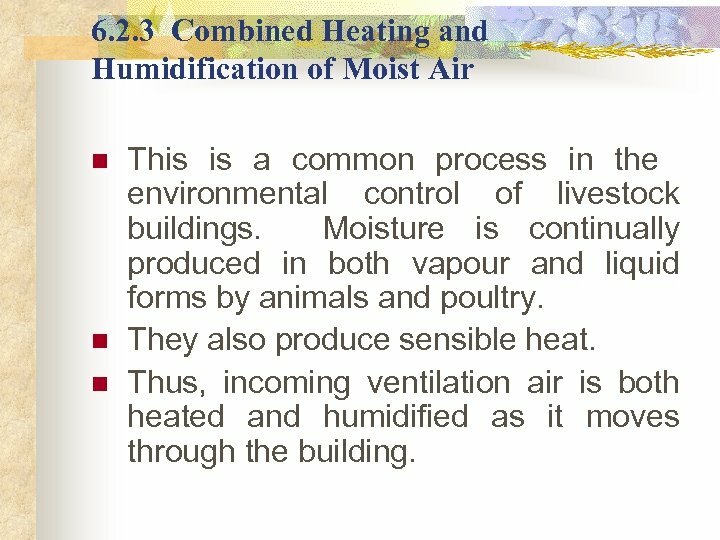 3 Combined Heating and Humidification of Moist Air n n n This is a common process in the environmental control of livestock buildings. 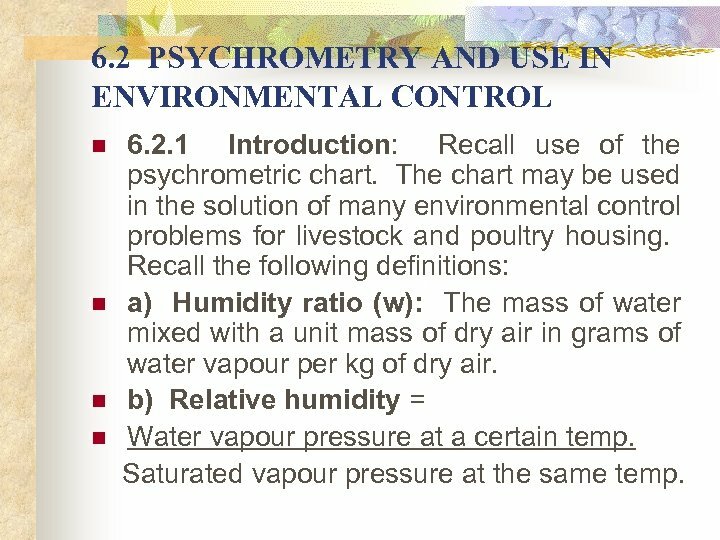 Moisture is continually produced in both vapour and liquid forms by animals and poultry. They also produce sensible heat. Thus, incoming ventilation air is both heated and humidified as it moves through the building. Solution Concluded n n n Mb = 300 m 3 /min x 1/0. 836 kg/m = 358. 85 kg/min = 21531 kg/hr. 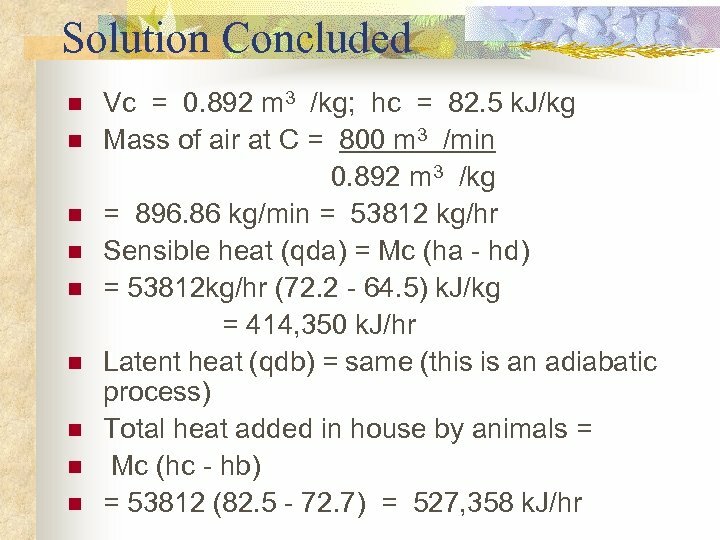 Sensible heat = qac = 21, 531 (29 - 16) = 279, 903 k. J/hr = 77. 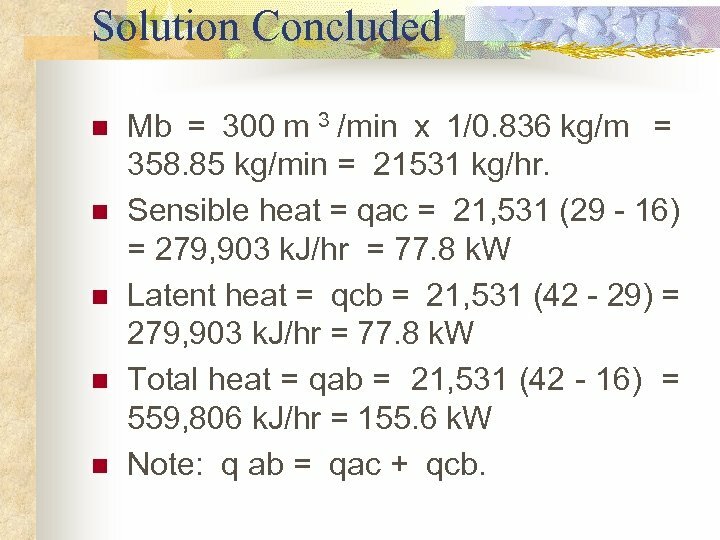 8 k. W Latent heat = qcb = 21, 531 (42 - 29) = 279, 903 k. J/hr = 77. 8 k. W Total heat = qab = 21, 531 (42 - 16) = 559, 806 k. J/hr = 155. 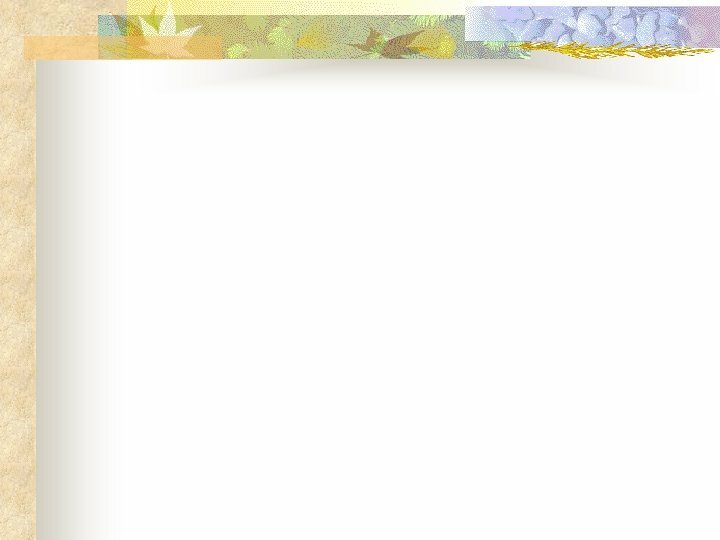 6 k. W Note: q ab = qac + qcb. 6. 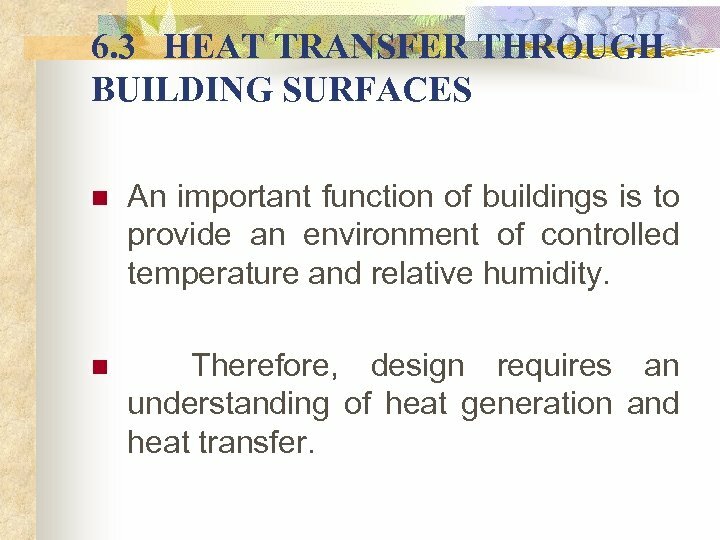 3 HEAT TRANSFER THROUGH BUILDING SURFACES n An important function of buildings is to provide an environment of controlled temperature and relative humidity. 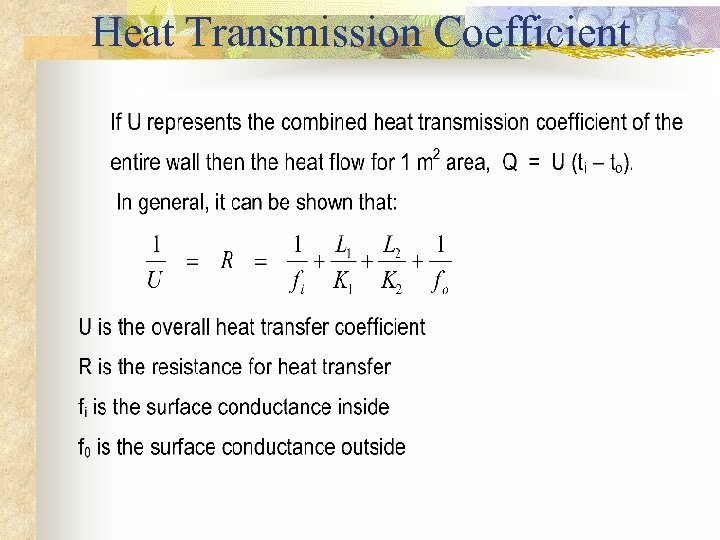 n Therefore, design requires an understanding of heat generation and heat transfer. 6. 3. 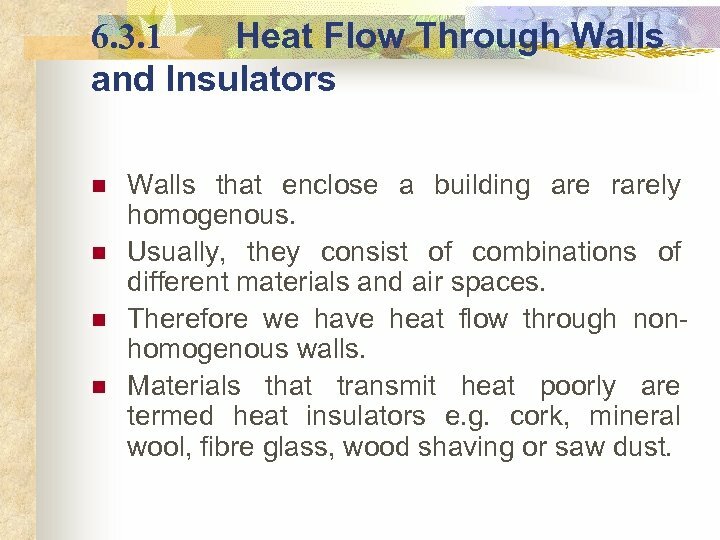 1 Heat Flow Through Walls and Insulators n n Walls that enclose a building are rarely homogenous. Usually, they consist of combinations of different materials and air spaces. 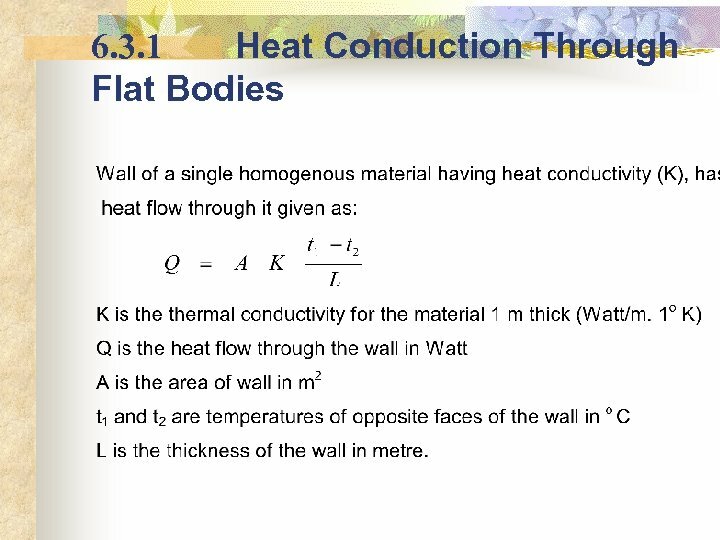 Therefore we have heat flow through nonhomogenous walls. Materials that transmit heat poorly are termed heat insulators e. g. cork, mineral wool, fibre glass, wood shaving or saw dust. 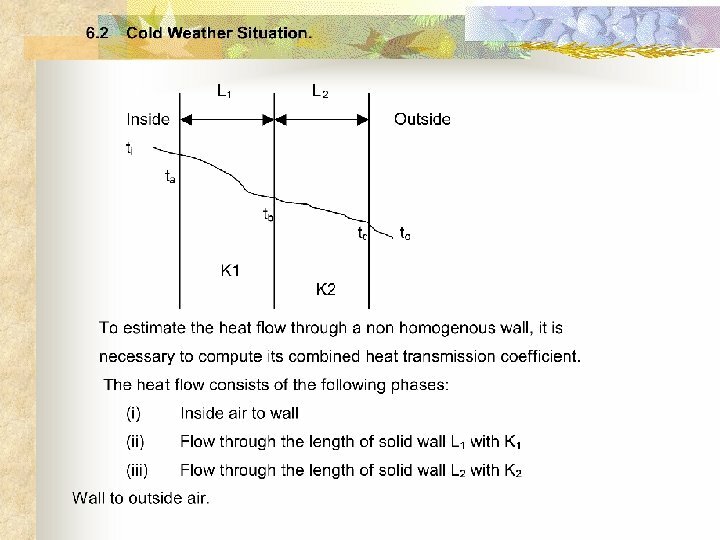 Heat Transfer Through Walls and Insulators Contd. n n n These coefficients are termed conductance. 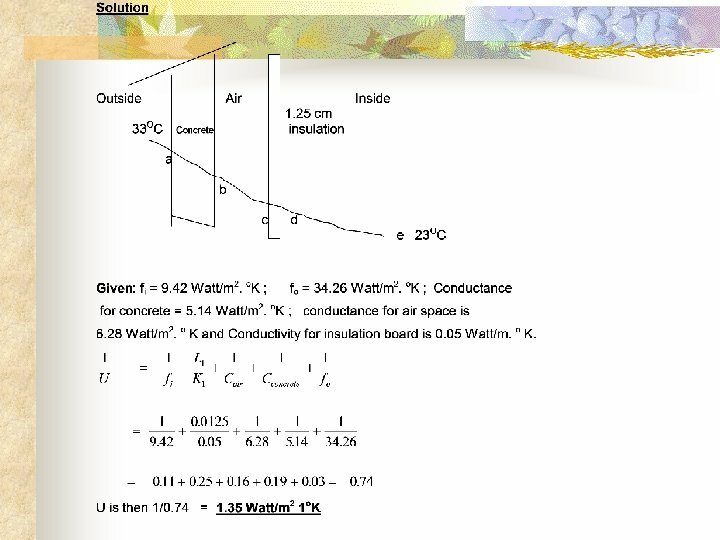 Its unit is Watt/m 2. o. K. Conductance differs from conductivity, which is given per m thickness. 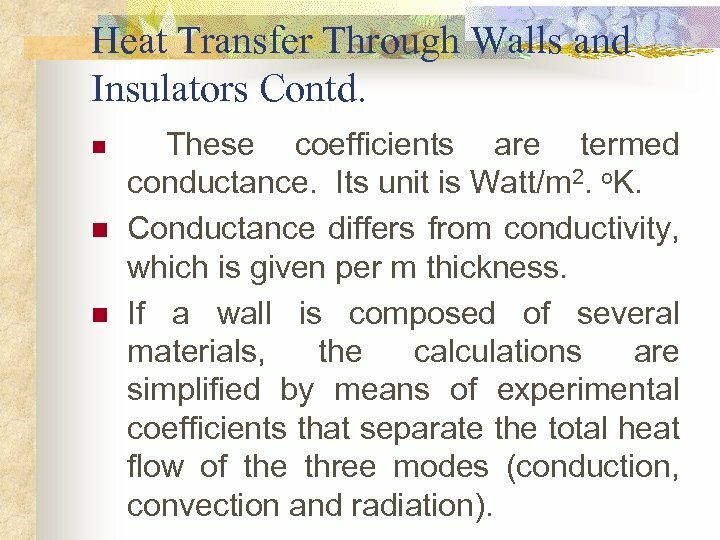 If a wall is composed of several materials, the calculations are simplified by means of experimental coefficients that separate the total heat flow of the three modes (conduction, convection and radiation). 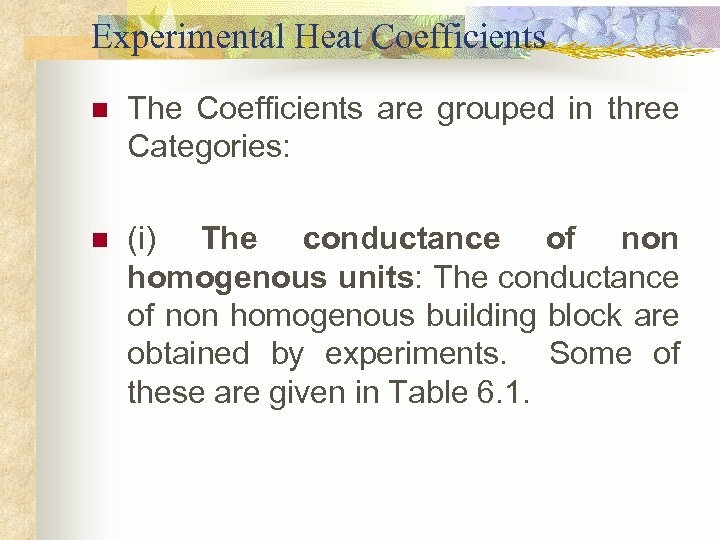 Experimental Heat Coefficients n The Coefficients are grouped in three Categories: n (i) The conductance of non homogenous units: The conductance of non homogenous building block are obtained by experiments. Some of these are given in Table 6. 1. 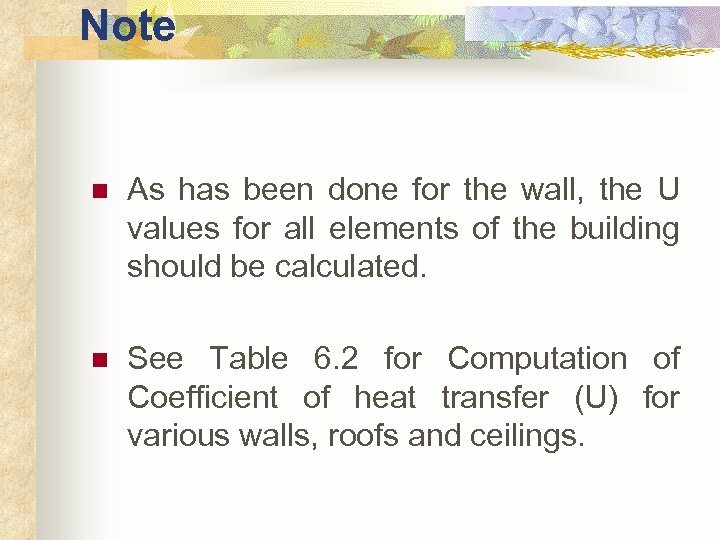 Note n As has been done for the wall, the U values for all elements of the building should be calculated. n See Table 6. 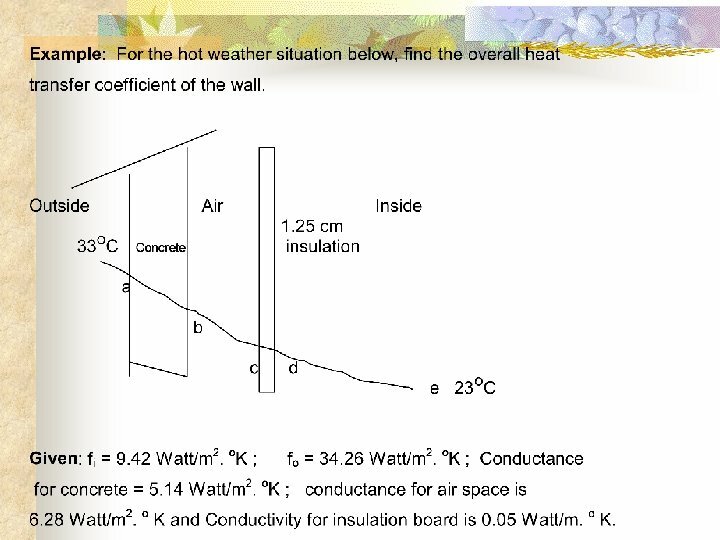 2 for Computation of Coefficient of heat transfer (U) for various walls, roofs and ceilings. 6. 3. 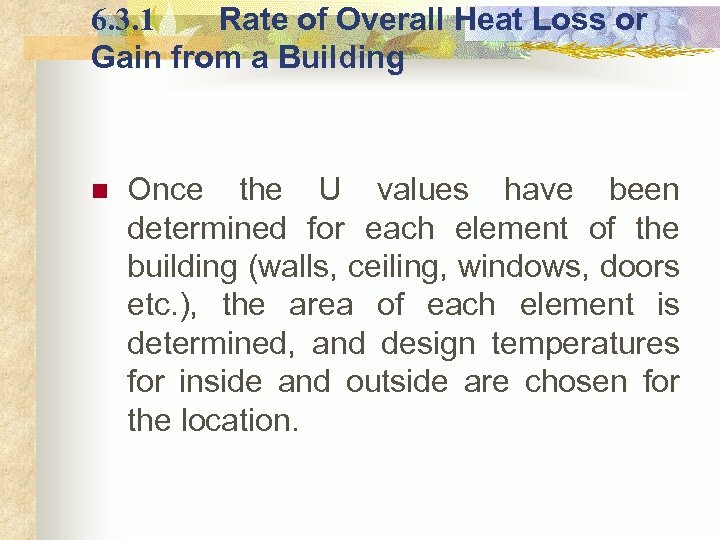 1 Rate of Overall Heat Loss or Gain from a Building n Once the U values have been determined for each element of the building (walls, ceiling, windows, doors etc. 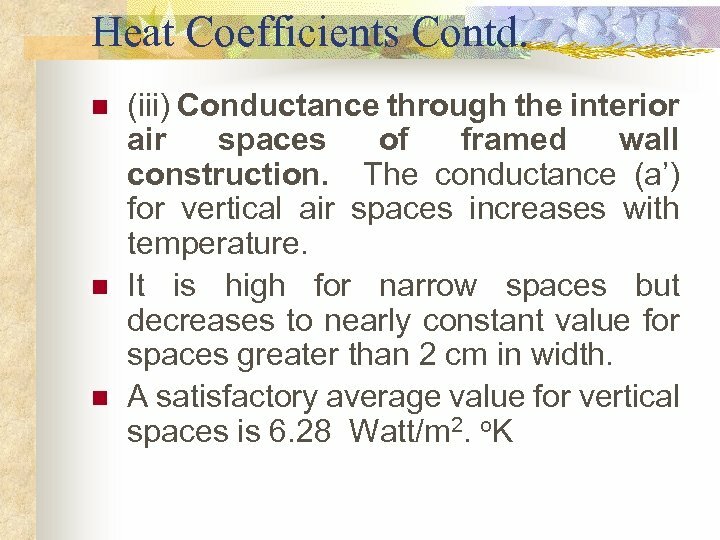 ), the area of each element is determined, and design temperatures for inside and outside are chosen for the location. 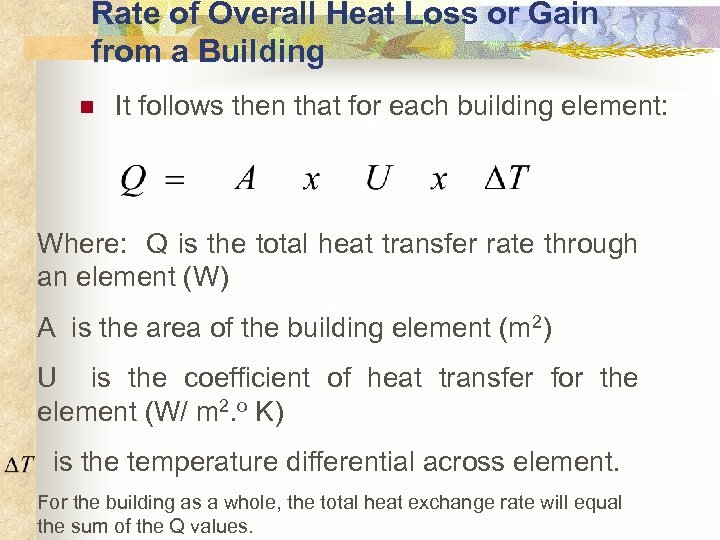 Rate of Overall Heat Loss or Gain from a Building n It follows then that for each building element: Where: Q is the total heat transfer rate through an element (W) A is the area of the building element (m 2) U is the coefficient of heat transfer for the element (W/ m 2. o K) is the temperature differential across element. 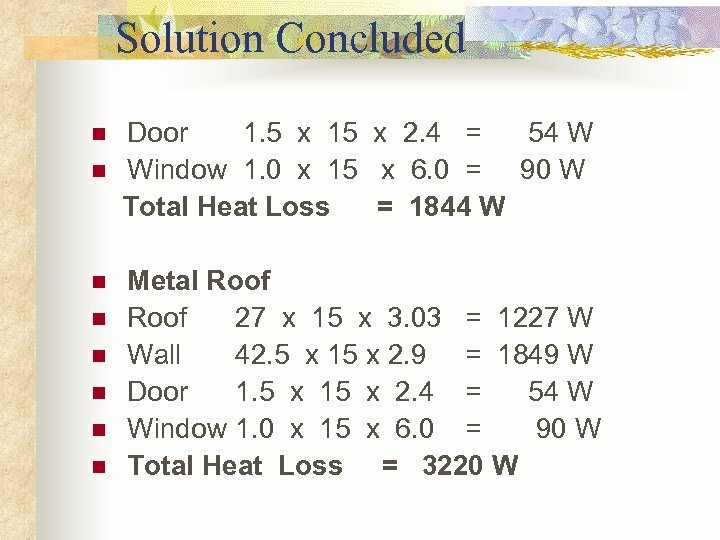 For the building as a whole, the total heat exchange rate will equal the sum of the Q values. 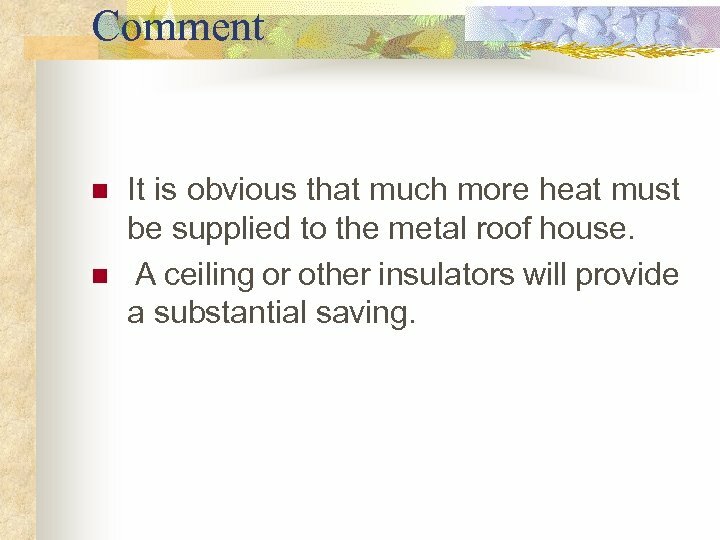 Comment n n It is obvious that much more heat must be supplied to the metal roof house. A ceiling or other insulators will provide a substantial saving. 6. 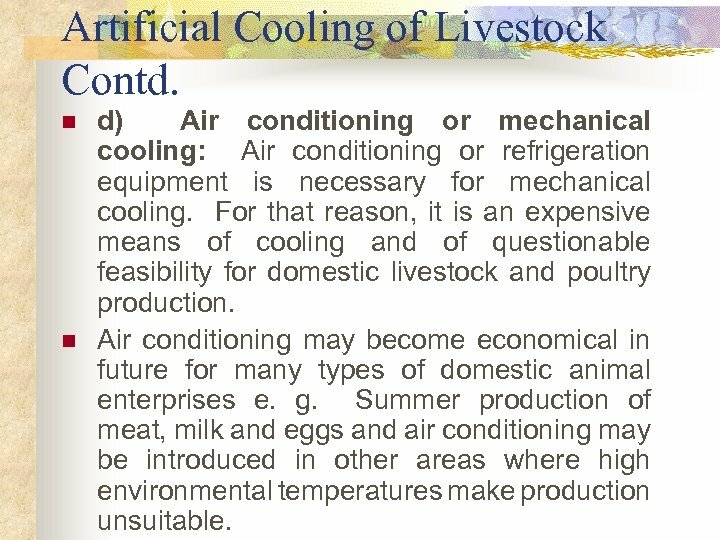 4 ARTIFICIAL COOLING OF LIVESTOCK n n n In general, livestock are considered to be depressed by temperature over 25 °C. 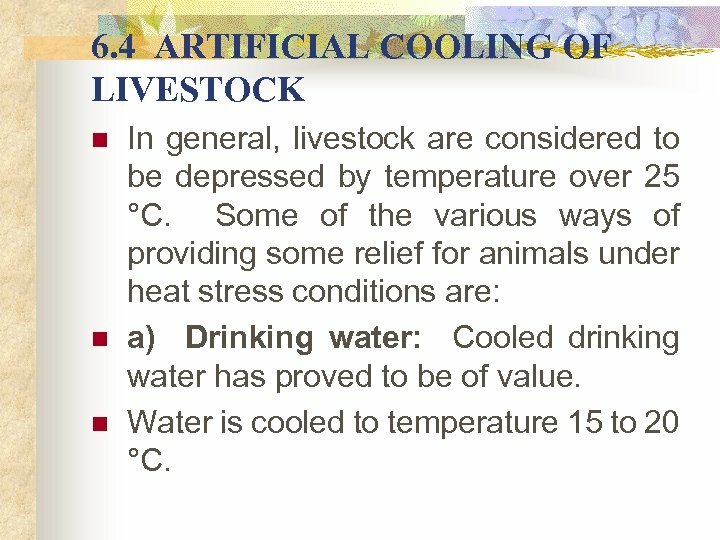 Some of the various ways of providing some relief for animals under heat stress conditions are: a) Drinking water: Cooled drinking water has proved to be of value. Water is cooled to temperature 15 to 20 °C. 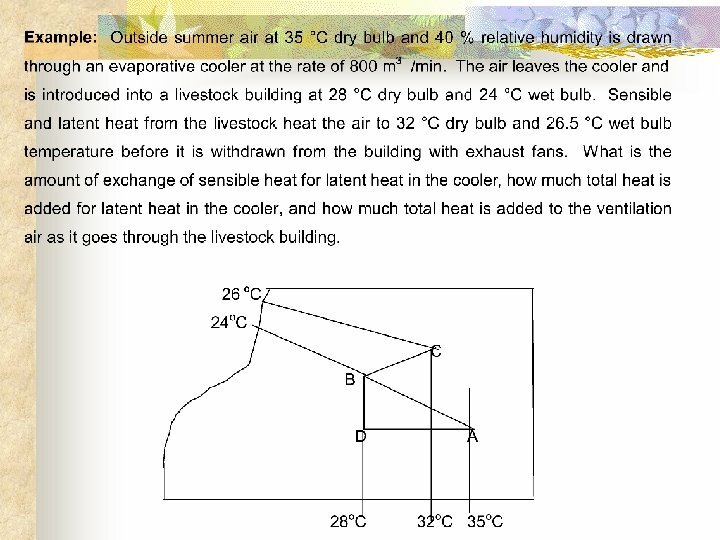 Artificial Cooling of Livestock Contd. 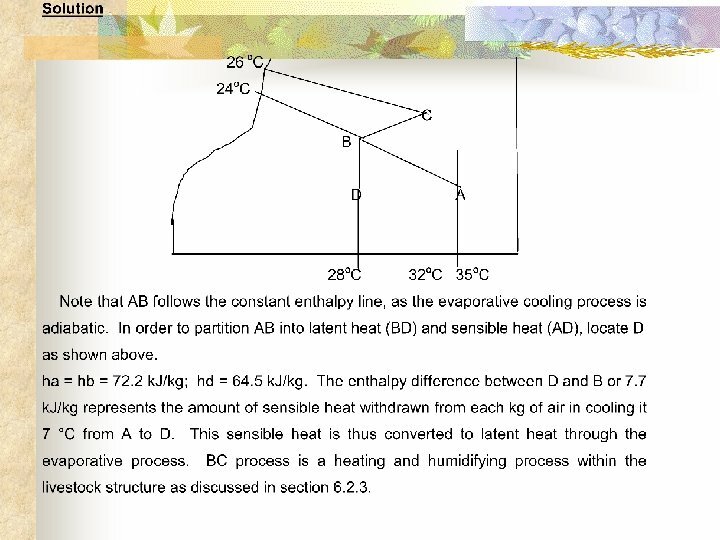 n n n c) Evaporative cooling: The absolute values of evaporative cooling would vary depending on pad thickness (say 6 to 10 cm), pressure drop and material. The method is successful in dry areas. With properly designed pads and air flows below 1 m 3/s, the dry bulb temperature of the incoming air can be reduced to within 1 1/2 ° C of the wet bulb temperature. 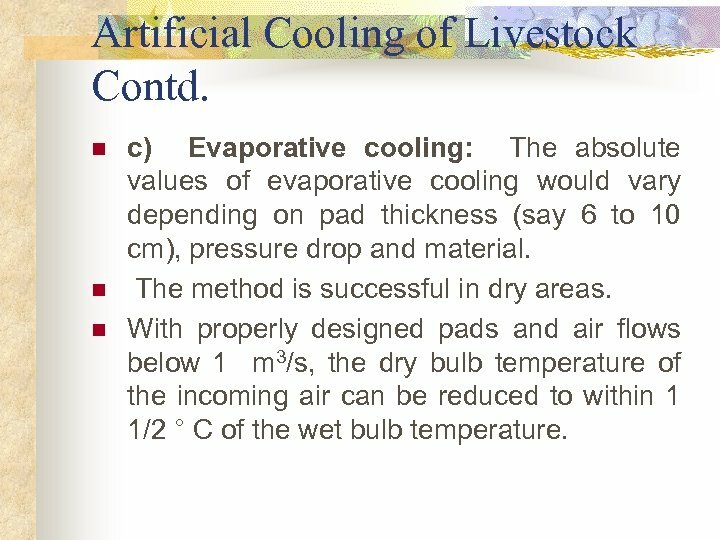 Artificial Cooling of Livestock Contd. n n d) Air conditioning or mechanical cooling: Air conditioning or refrigeration equipment is necessary for mechanical cooling. For that reason, it is an expensive means of cooling and of questionable feasibility for domestic livestock and poultry production. 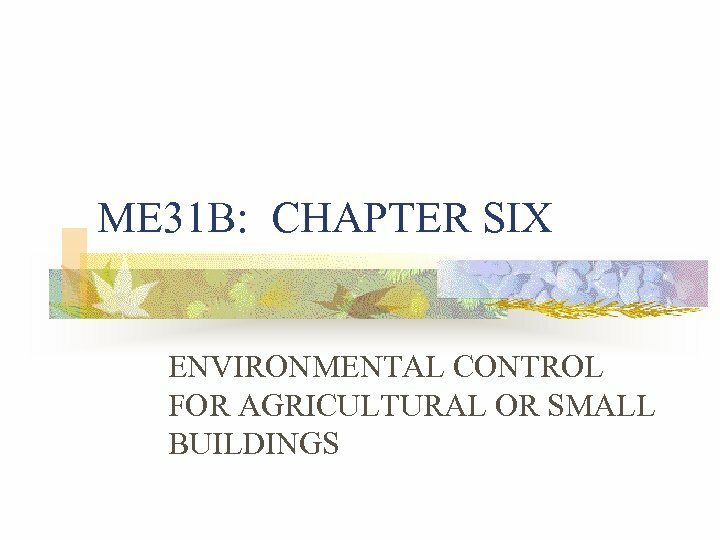 Air conditioning may become economical in future for many types of domestic animal enterprises e. g. Summer production of meat, milk and eggs and air conditioning may be introduced in other areas where high environmental temperatures make production unsuitable.